Sunlight Soap – enamel sign attached to railings. Bruges via Harwich – 1933 poster produced for the London & North Eastern Railway, showing a night-time view of the illuminated Carillon bell tower in Bruges town square. Artwork by Frank H Mason (b.1876 – d.1965). (Object number: 0001-3337). East Coast Frolics No.1, “I Do Like to be Beside the Drier Side” – Poster, London and North Eastern Railway, East Coast Frolics No 1. “I do like to be beside the – Drier Side!” – travel cheaply by LNER, 1933, by Frank Newbould. With a cartoon of a duck in a Pierrot costume singing while standing next to a piano being played by a mouse. On an orange background. Format: double royal. Dimensions: 40 x 25 inches, 1016 x 635mm. This is one of a set of six humorous posters exhibited in the 1933 LNER Poster Art Exhibition at the New Burlington Galleries in London. (Object number: 1978-9470). Essex Coast – Poster produced for the London & North Eastern Railway, showing fishing smacks on the water, their catch of oysters, and an underwater scene depicting the use of a dredge. Artwork by Frank H Mason, printed by Ben Johnson & Co Ltd, York. Bovril Brightens up old Buffers – unfortunately, only one reference to this poster has been found which simply states that it was common at stations in the 1930’s. 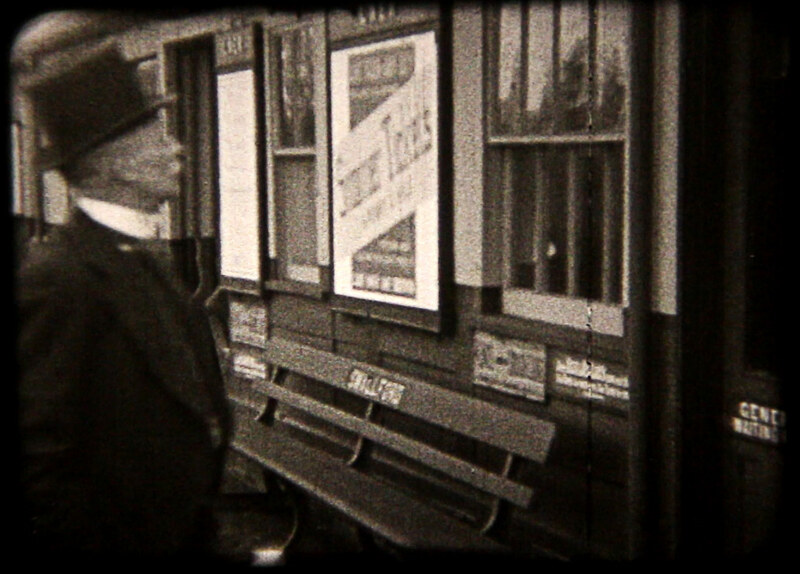 By collaging various stills from the 1933 footage, a near complete picture of the two-part advert can be seen below. There is one advert still eluding identification. It appears to say either, “Summer Tours”, or, “Summer Tickets”, but there is the possibility it says neither! Can you help identify the poster shown below? Other details you may notice in the still are the General Waiting room sign on the door to the right of the still and the Smallford branded bench. Prior to seeing this footage, it was unknown the general waiting room was located in this corner of the Smallford Station building.